Elton John and Tim Rice’s AIDA is a contemporary musical take on a grand classic tale of the timeless bond between an enslaved Nubian princess and an Egyptian soldier. As forbidden love blossoms between them, the young lovers are forced to face death or part forever. Together they set a shining example of true devotion that ultimately transcends the vast cultural differences between their warring nations, heralding a time of unprecedented peace and prosperity. 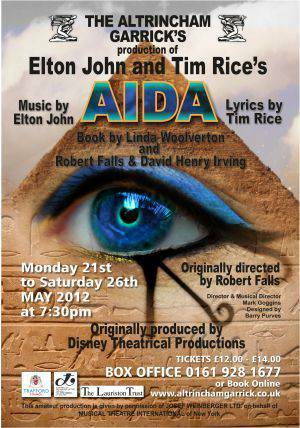 Aida; Disney's pop version of the ancient Egyptian saga retold to a score written by pop music icon come Musical Theatre composer, Elton John with lyrics by Tim Rice. The Altrincham Garrick?s enjoyable production revels in the tales new shimmering surface, comical additions and melodramatic flourishes. The score is a mostly forgettable follow-up to Elton & Tim?s first Disney collaboration ?The Lion King?. A few solos and duets are pretty but the funniest and most memorable song ?My Strongest Suit? reflects the Elton John many of us love for his flashy showmanship and outrageous clothing! Kudos must go to the designers and technical team for some gorgeous and effective lighting, a well thought and constructed set, though the biggest statement of all goes to the costume department?s fabulous team, who?ve produced no less than a dazzling selection of costumes! Letitia George shines as Aida, her opulent vocals were delightful as was her powerful character which oozed quality. She brought comedy and sincerity to the part which worked beautifully. Dan Booth as Radames had a nice, modern pop voice. He acted well, was instantly likable and delivered his lines with genuine feeling. We should see someone who commands the stage with authority and poise in this role so I cannot ignore his posture which didn?t reflect the characters status. As the impish servant Mereb, Ben Hutt quickly becomes an audience favourite and achieves a touching final moment. Princess Amneris was portrayed with gusto by Stephanie Niland who delivered comedy, status, sass and style then beautifully turned this around to display a proud yet heartbroken woman in a stunning rendition of ?I Know The Truth?. Her scene before the wedding was my favourite and most fulfilling part of the production. I cared more for her heartbreak than I did for the leads ?getting it on? which is a notable achievement! ?a very confident, natural and well delivered all round performance. The choreography was simple, tight and effective but above all it was unpredictable! Laura created nice patterns and uniform movement with subtle accents in all the right places. For me, there was a lack of passion and spark between Aida and Radames, the relationship was undeveloped making the love hard to believe or even care about however, this was still a production of high standard. The band sounded great though I would have enjoyed them more if they were louder, as this is a pop score, more volume would have given some punch and attack which would have injected even more energy into the piece! The fortunate facilities of the Garrick?s team were prominent and helped take this production from ?great? to ?wonderful?. The show kept moving and flowed with ease making it a delightful experience. The Garrick?s next season has been announced, I am looking forward to it immensely. I have every confidence we will be treated to even more high class entertainment with the exciting line up of plays, a panto and a musical from the never stopping team at the Garrick! Have a terrific Summer, see you in September!